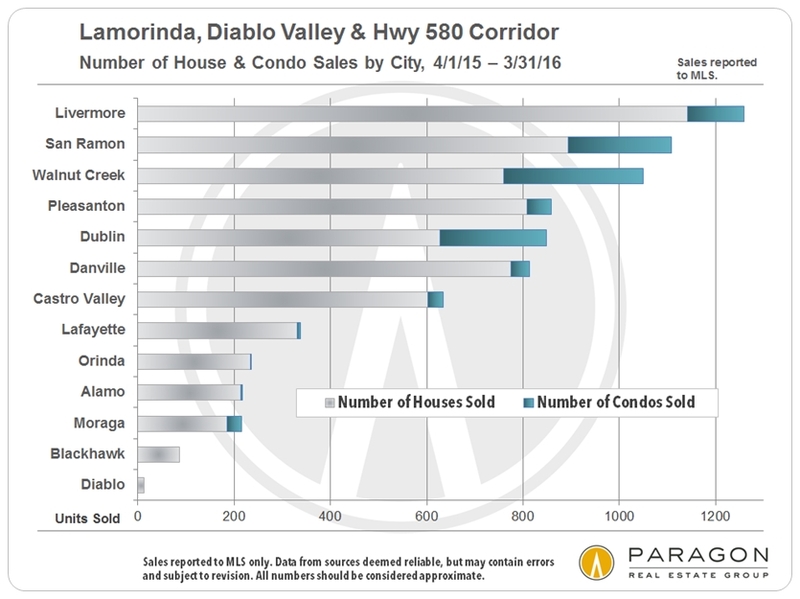 Looking at the statistics and trends for the homes markets of Lamorinda, Diablo Valley and Hwy 580 Corridor, what stands out is how remarkably steady their core dynamics have remained in recent years. Inventory remains low by historical standards and has continued to decline in Q1 2016. Demand remains high with a very low average days-on-market figure and a very large percentage of listings accepting offers. 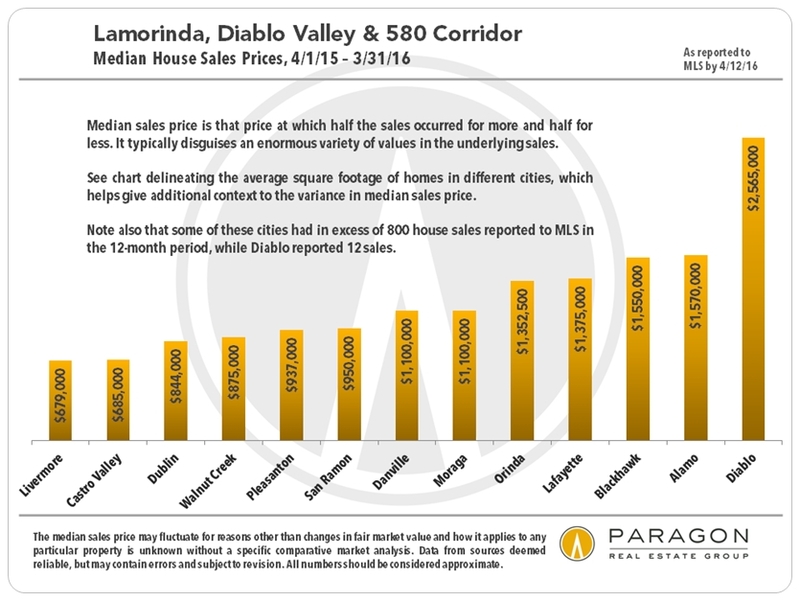 Median prices have continued to increase, year over year. 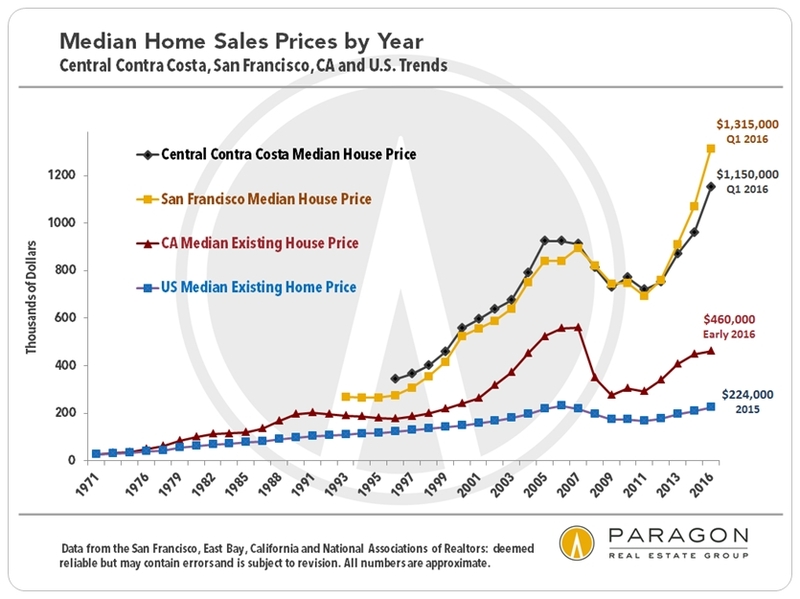 The market has been strong since the recovery began in 2012, but, generally speaking, not the overheated frenzy that has often prevailed in San Francisco and San Mateo. 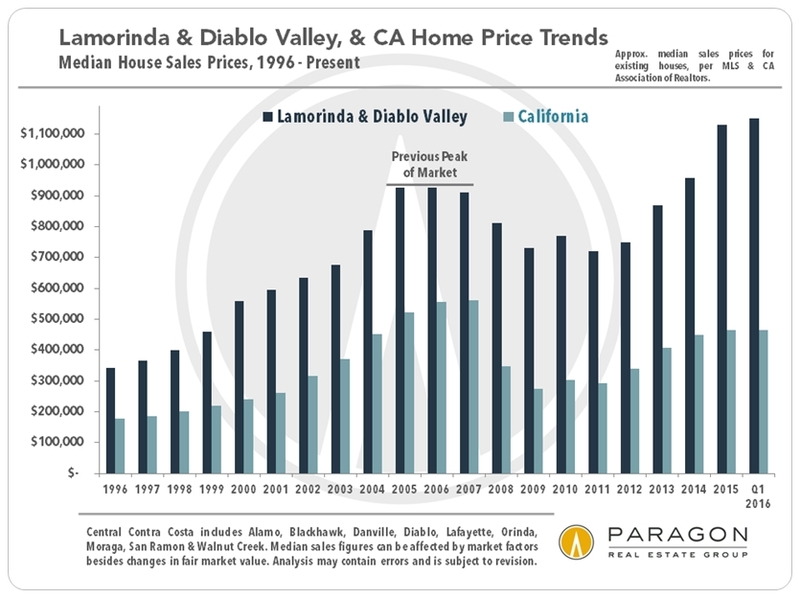 Indeed, one of the important dynamics currently playing out is that though home prices here are high by any state or national standard, they are significantly more affordable than in the city or the heart of Silicon Valley. 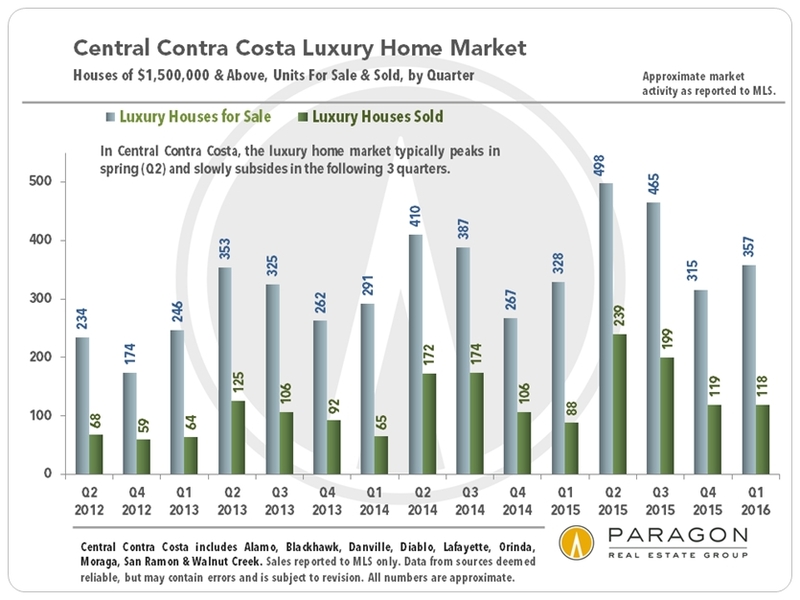 Q2, just started, is typically the most active quarter of the year, with new inventory pouring onto the market and buyer demand usually at its peak. Will prices continue to appreciate at the rate of recent years or are they coming to a point at which they finally plateau? Much more will be known about where the market is going as Q2 data becomes available. 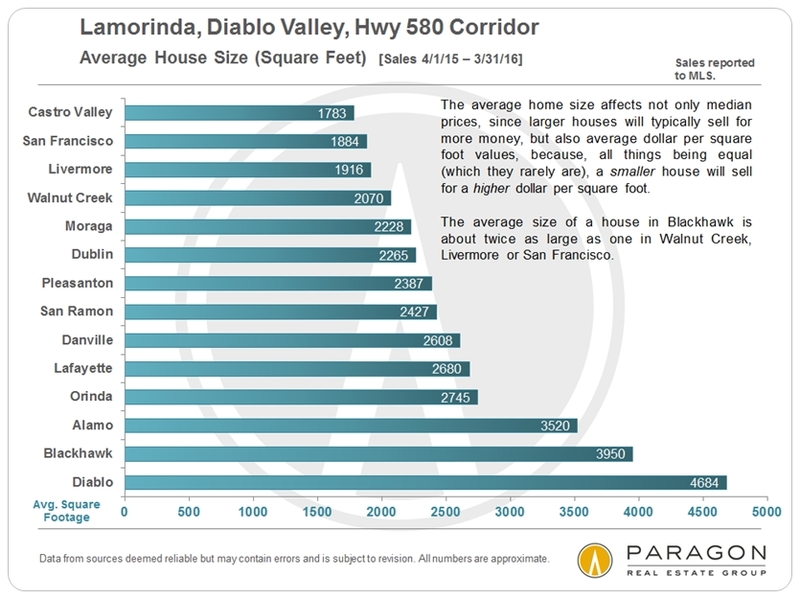 Some of the most affluent communities in the country are in Lamorinda and Diablo Valley, and unsurprisingly, the smaller cities in the area, with smaller real estate markets, often feature the largest and most expensive homes. 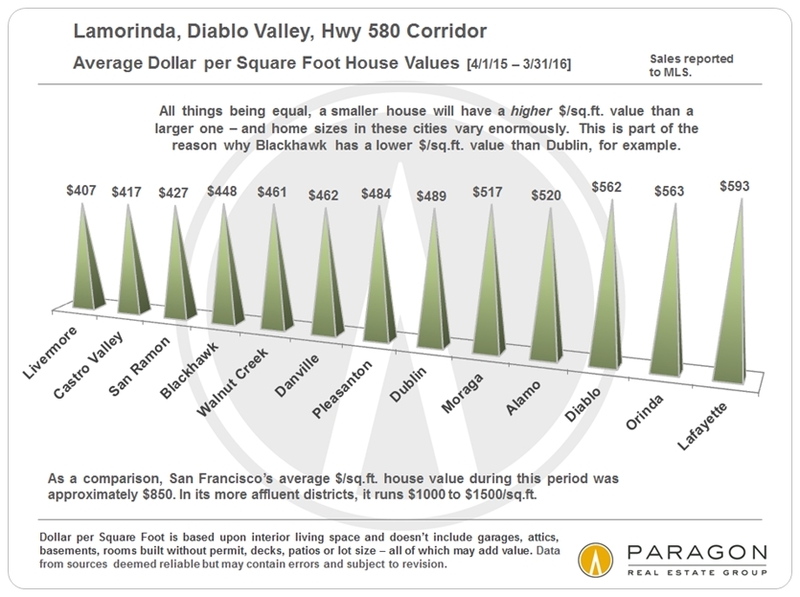 Average dollar per square foot values run roughly half that of San Francisco and the heart of Silicon Valley: One gets much more home for the money and this is drawing new, motivated buyers to the area. 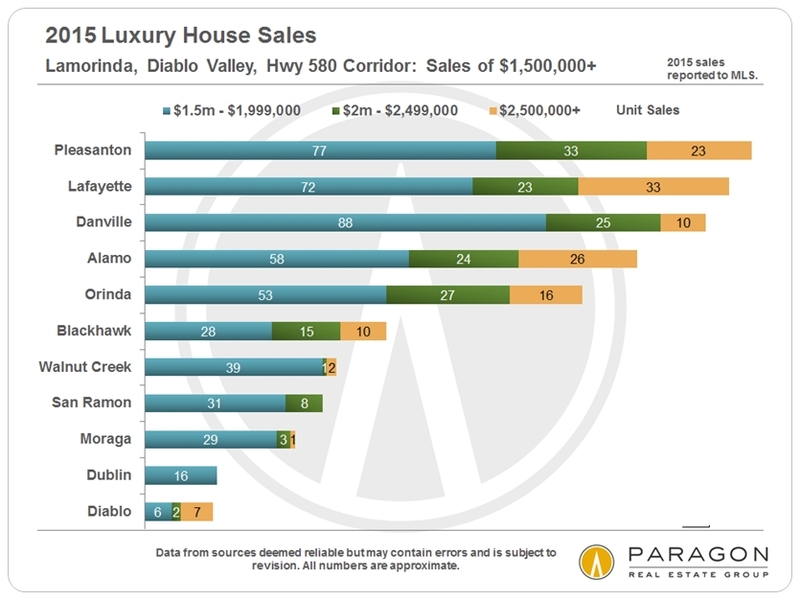 The spring selling season, stretching from March through early June is by far the most active of the year for high-end home sales. 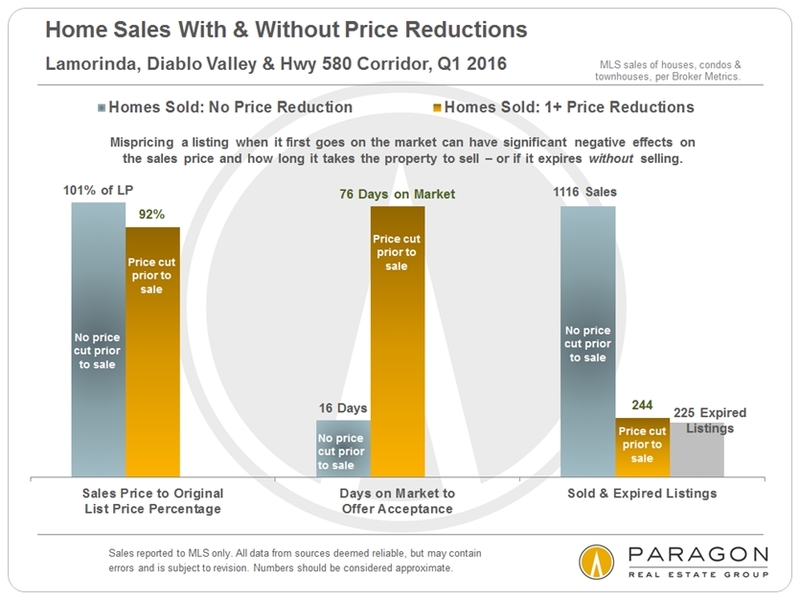 Since sales close 4 to 8 weeks after new listings arrive on market, they mostly show up in the statistics for Q2 and Q3. 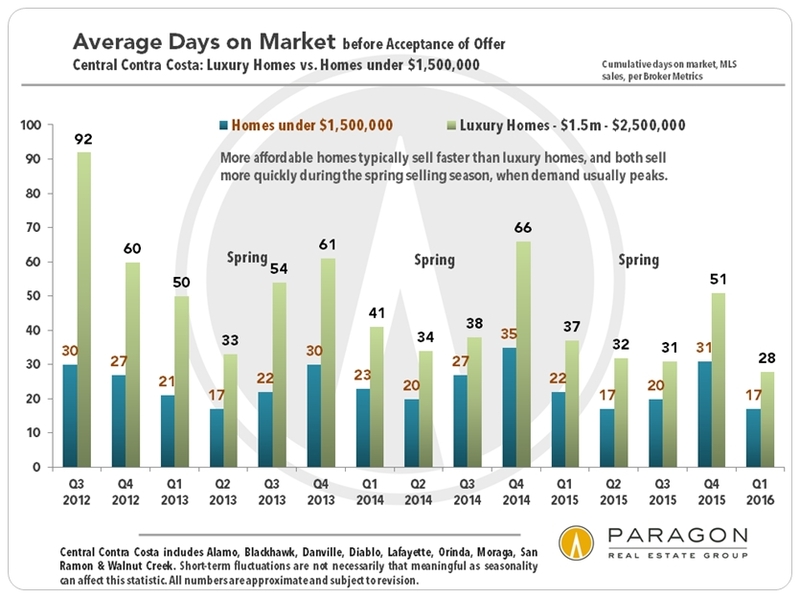 As will be seen in a chart below, more expensive homes typically take more time to sell than less expensive ones, however average days on market usually fall to their lowest numbers in spring when buyer demand and competition for new listings is usually most intense. 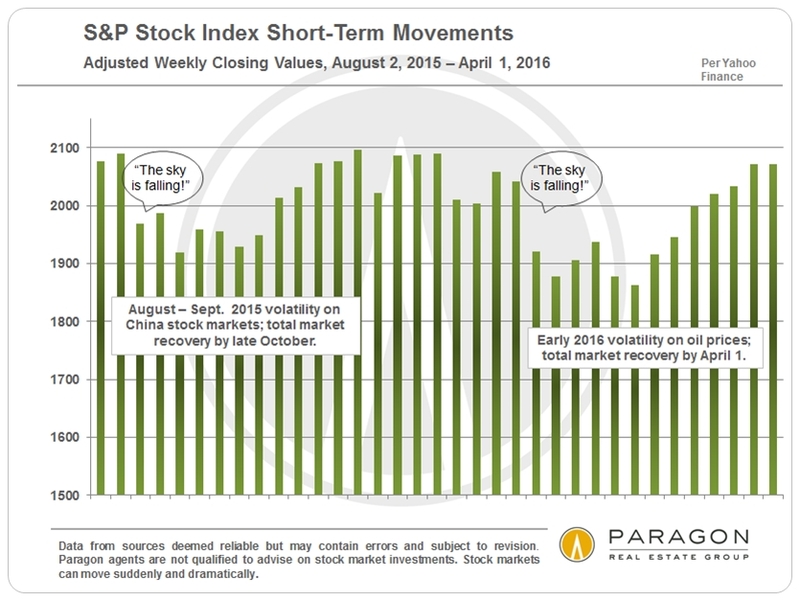 After all the travail regarding stock market volatility since last summer, it is now, as of early April, pretty much back to where it began. 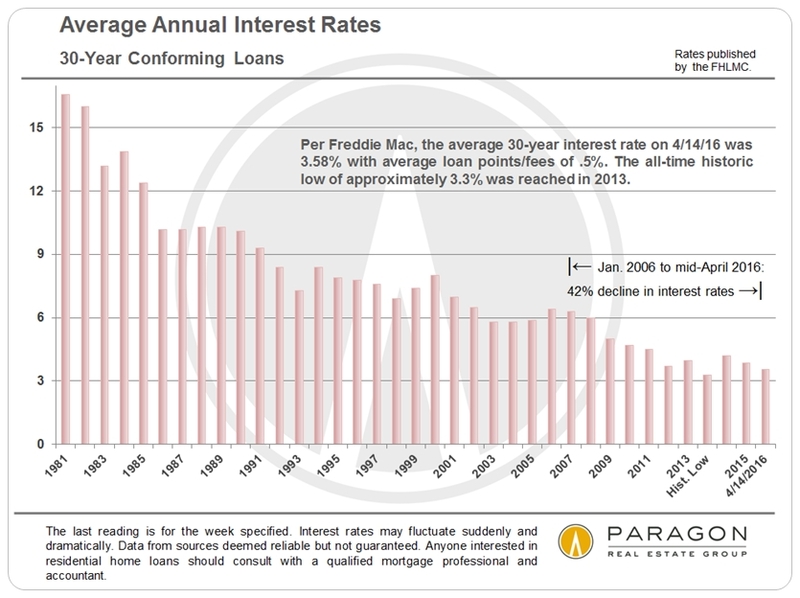 And interest rates have actually fallen since the Fed raised the benchmark rate in mid-December. 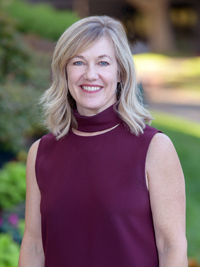 These conditions are typically considered very positive for real estate markets, though both can be subject to sudden and significant change. These analyses were made in good faith with data from sources deemed reliable, but they may contain errors and are subject to revision. Statistics are generalities and all numbers should be considered approximate. 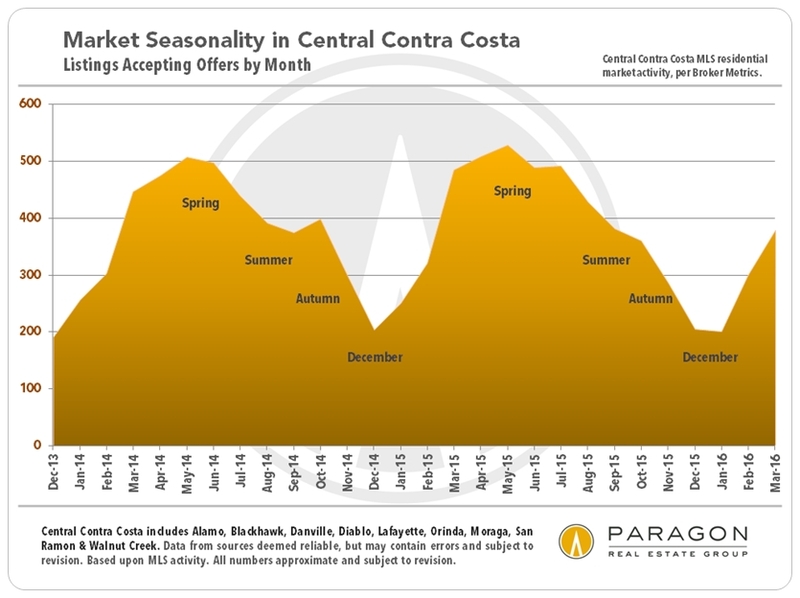 Sales statistics of one month generally reflect offers negotiated 4 to 6 weeks earlier, thus a fair number of Q1 2016 sales reflect market activity in late 2015.